Fur Coat explore the power of thought in their first album for Crosstown Rebels, ’Mind Over Matter’, after a steep climb into mainstream consciousness. The Venezuelan duo were spotted by Crosstown Rebels head Damian Lazarus little more than eight months ago, and they have since been on lockdown to complete their first studio album. Bringing together some supreme guest vocalists such as Mel Blatt of All Saints fame, the young NYC star Rap Lisa, Big Bully known for his previous work with Jay Haze, Cari Golden, Argenis Brito and Stee Downes, the result is primed for a release on October 2nd. The duo plant the colour of their own continent - ‘Interlude’ takes a sample from the Venezuelan talking clock - while adding their own twist from their travels and supernatural experiences in mind-bending cuts such as ‘Spirit’ and the anthemic ‘You And I’ featuring Cari Golden. 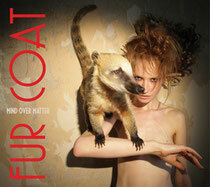 Fur Coat is the brainchild of Sergio Muñoz (Delete) and Israel Sunshine, two fresh producers from Venezuela. Their first single ‘Space Ballad’ featuring Argenis Brito featured a huge remix by Totally Extinct Enormous Dinosaurs and kept all eyes firmly focused on the duo. The worlds of Sergio and Israel collided in 2004 in their hometown of Caracas but crunch time came in Barcelona, summer 2010 when the pair decided to develop their sound collectively. Intent on making something fresh and futuristic, they work with shades of the soul, funk and disco music they share as influences. Combined with the omnipresence of Latin music growing up, a formative cocktail of Giorgio Moroder, Larry Levan and La Fania All Stars and Salsa Brava led to a vibrant musical philiosophy and powerful desire to work their magic on the dancefloor.